A soothing voice that speaks to the heart of what each one of us needs...to know the One who made us and knows our every need. The music moves and the message is clear. The greatest event of my life came at the age of 34 when I responded to the Lord’s call on my life and humbly accepted Christ as my Savior. How life has changed since then! No, it hasn’t always been easy, but life’s been significantly better. And I have hope in a future guaranteed by Christ, Himself! My interest in music began at the age of 7 when I started studying piano. In middle school I took up the study of the oboe which continued through high school. I love to sing and remember taking part in a children’s choir at my family’s church. After high school I attended Bryant College (now Bryant University) in Rhode Island and four years later graduated with a degree in Office Administration. At the age of 23 I married my husband, Pat, whom I met at Bryant and we set up our home in Connecticut. We have shared many good years and have been blessed with two wonderful children, Samantha (now a teenager) and Patrick (pre-teen). Both have accepted Jesus into their hearts…what more could we ask for. Pat and I spent many years not knowing personally the love of our Lord…how our relationship has grown and blossomed since we both committed our lives to Christ. God is good…all the time! Music has always been part of my life, but it wasn’t until I was born again in Christ that I had any real desire or inspiration to song write. Well, that all changed and I find great joy in writing and singing songs that praise God and speak to the heart of people. I was able to listen to some of your CD at the Habesch's and I enjoyed it. Your voice is beautiful and it felt truly calming. The music is very lovely and soothing to listen to. Good luck and thanks for sharing your gift. The songs are varied and uplifting. The musical accompaniment never overpowers the artist's soulful sound. The songs have a calming, transforming power to them. I enjoyed it all! Love your music and your voice ... peaceful and moving. Thanks for sharing your gift with us. Beautiful words of praise.. straight from the heart. Songs sung with sincere joy and honor to our Lord. Thank You. This CD is a great pick-me-up, entertaining and truthful. The title song is an affirming anthem that offers a cure for the pressures we all face. "Tale of the Trail" is a playful retelling of the life of Christ that my little son started singing at a store one day. "Beautiful Distance" makes me wonder at the Grand Canyon though I've never been there. The music on this CD is both relaxing and uplifting. It's a great pick-me-up when I need a break from the every day stress. Peg's songs are unique and creative, easy to relate to, and sung so beautifully. Thanks, Peg! 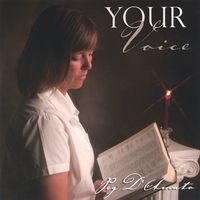 "Your Voice" brings tears to your eyes. This is beautiful music. The title song brings tears to your eyes. The lyrics are thought provoking and humbling. Simply wonderful to listen to. This album really ministered to me. Peg's voice is great to listen to - like honey to the soul. I also enjoyed the lyrics and was deeply moved by several songs. Peg uses her voice to share...His voice! Peg sings with a confidence of knowing which road, which 'trail' she is on. And she tells stories about real people, real challenges who find answers in their faith. I listed to "He's Everything" in the car one morning, and then was singing and humming the tune for the next 3 days! Thanks Peg, for sharing your gifts with us!